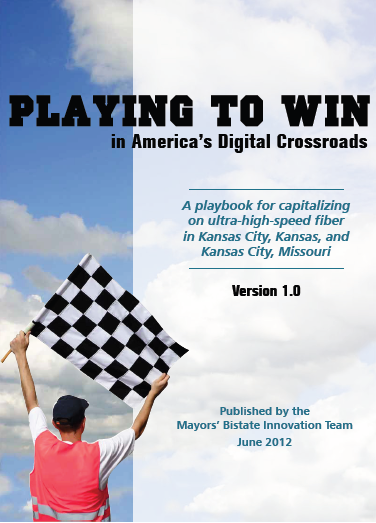 In September 2011, Mayors Sly James and Joe Reardon appointed the Mayors Bistate Innovation Team (MBIT), and charged its members with developing a playbook of creative ways the community can use Google Fiber to spark economic development, advance opportunities and improve daily life in Kansas City. Over the following seven months, team members and many other interested parties pondered the implications of high-speed broadband for the future of the region. MBIT met with representatives of many different sectors in the community including neighborhoods, schools, libraries, hospitals and health providers, arts and cultural organizations, businesses and entrepreneurs. The goal of all these meetings was to learn from the community what kinds of things it wanted and believed to be possible with high-speed fiber. What emerged was a picture of a community alive with dreams and visions for a better Kansas City — one enriched by broad, even universal, access to high-speed Internet connectivity and trained to take advantage of all it can offer. What was also clear is that such a benefit came with concerns and cautions. If digital inclusion — making technology accessible to everyone — was not the first plank in the community’s digital platform, the opportunity for true transformation will be constricted, if not lost entirely. From all this dialogue MBIT captured only a portion of what was heard and even less of what was dreamed. But it was a start. The Playbook was first launched in April 2012. It was presented in digitized form (i.e., version 2.0) in December 2014 with the launch the website you’re reading now. Playbook 2.0 contains updates in the form of Projects. These are real, live implementations of the original Plays. They are categorized both by Play and by subject matter (Education, Government, etc.). Regardless of format, the Playbook is a work in progress. It’s one that is likely to outlast terms of office and even lifetimes — to harness the energy and capture the visions that dwell throughout this vibrant community and help them become realities. In the spring of 2012, KC Digital Drive was commissioned to carry out the Playbook. We are a 501(c)3 nonprofit organization with the broader mission of supporting technology projects that yield positive civic outcomes. A successful Internet economy is 90 percent sociology and 10 percent technology. While Google’s selection of Kansas City, Kan., and Kansas City, Mo., for its first ultra-high-speed, fiber-to-the-home network was the catalyst for this playbook, it’s really not about Google — or any other broadband provider. It’s about sociology, not technology. It’s about becoming a connected, smart, innovative community. It’s about how we organize ourselves to lead the way in the global economy. Our two cities, and the entire Kansas City region, have an unprecedented opportunity to harness gigabit speed and use it in ways that are relevant to everyone in the community — to improve our neighborhoods, our institutions, our economy, and our lives. But this opportunity has an expiration date. Today, we can begin to realize the benefits of cutting-edge technology. But to stay in the forefront, each community must be willing to quickly commit the appropriate resources of people, funding and time. We have to move beyond KCMO and KCK to engage our whole regional economy. We have to move beyond the mindset that says holding information is power to one that says sharing information is greater power. In short, we need people to behave like the Internet —navigating a new ecosystem of innovation, collaborating across new networks, building on each other’s ideas, and growing organically. High-speed fiber is a game changer, but what we do with it defines the game. In a biological ecosystem, plants and animals thrive when in balance with light, air and food. Our metropolitan Internet ecosystem will thrive with a balance of social, economic and technological resources that creates a transformative and thriving community. A metropolitan Internet ecosystem is a synergistic alignment of systems that can produce sustainable results. Our game plan is to use an ecosystem model to maximize the impact of each “play” in this playbook and use new technology to complement the strong, existing assets of our region. METRICS — ways to measure performance. Thoughtful metropolitan Internet ecosystems are a powerful tool that can be used within a market sector, across all market sectors, or both. The ecosystem concept provides a practical foundation for moving the community forward. High-speed fiber cannot reach its full potential if large segments of society are excluded from its benefits. Just as every stadium has ground rules based on its unique characteristics, we have identified some ground rules for taking full advantage of ultra-high-speed fiber in Kansas City: building community, digital inclusion, global leadership, achieving excellence, creating a culture of innovation and networked collaboration. These are the underlying, organizing principles which will determine how we play and whether or not we win the game. While high-speed Internet will allow us to connect in new and faster ways, it is up to us to find and develop new models of human interaction that go beyond speed and technology to build a stronger, more connected community. We must organize ourselves — beginning at the neighborhood scale and in every neighborhood — to take full advantage of the short window of opportunity that high-speed fiber gives us to lead the way in using technology to positively impact our daily lives. Broadband Internet access helps pave the road to success in today’s society. The Internet is not just a source of news and entertainment, but a crucial component of everyday living and commerce. Those who don’t have Internet access are isolated from many of the opportunities their friends and neighbors have. Businesses, too — particularly small and start-up firms — need access to high-speed broadband services. High-speed fiber cannot reach its full potential if large segments of our community are excluded from its benefits. It is critical for leaders in Kansas City, Kan., Kansas City, Mo., and the entire region to develop strategies for digital inclusion — not only to help individuals and families, but also to drive economic growth. The Kansas City region has a brief window in time, before high-speed Internet is universally available, to establish aleadership position in using high-speed Internet access to drive economic, social and cultural growth. To do this, we must focus on innovative pilot initiatives that validate the viability and value of higher speed broadband. We must also develop the technology sector workforce in the Kansas City region to take full advantage of the opportunities presented by Google fiber.The plan for success is up to us. We must commit resources, both financial and human, and work collaboratively to develop sophisticated marketing efforts that tell the world what we’re doing. Our aim must be to achieve the best outcomes in each endeavor associated with the high-speed fiber initiative. This means sparking catalytic demonstration projects that will turn traditional ideas upside down at the same time they provide growing capacity in all parts of the community. We will need strategic ongoing leadership that drives an ambitious agenda — not to direct or control, but to create capacity and provide a place to share emerging ideas and technologies. New systems that support technology-based entrepreneurial and business development will emerge as we move further into this world. We need to support new ideas, remove regulatory obstacles, generate resources and build community support for longer-term, infrastructureoriented initiatives that foster a culture of innovation in which residents, professionals in all areas, entrepreneurs and business owners are continually supporting the capacity to create, use and benefit form digital innovation. New networks that connect people and organizations outside of traditional silos — reaching across jurisdictional boundaries and across industry sectors —must be developed to reach every corner of the community where there is interest and energy. By fostering interaction and collaboration among new and existing networks, we can facilitate innovation and connect technology developers with users in targeted markets, helping to move the Kansas City region into the new digital economy ahead of our global competitors.